A new documentary sheds light on an overlooked truth behind man versus machine competitions. AlphaGo, a documentary about a Google computer program's victory over Korean Go champion Lee Sedol, opens on Friday in New York City and Los Angeles next month. Go is an ancient game in which players place black and white stones on a grid and win by claiming the most territory. 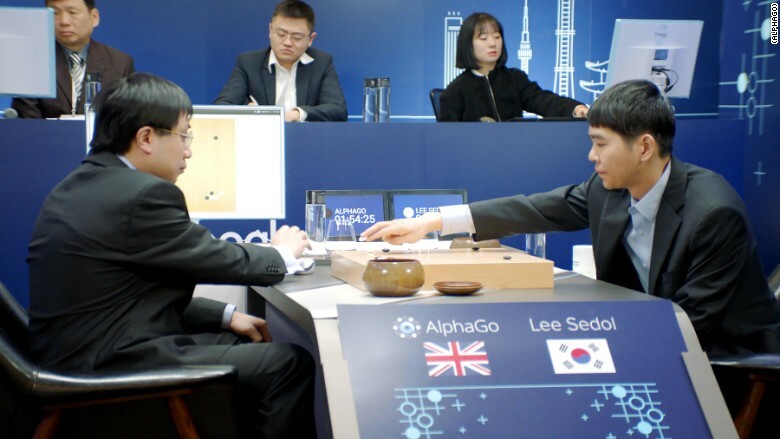 AlphaGo, the Google program, and Sedol played a best-of-five series in Seoul, Korea in March 2016. The match drew worldwide media attention, especially in Asia, where the game is especially popular. Sedol entered the match expecting to win. AlphaGo had beaten a pro before, but not the world's very best. 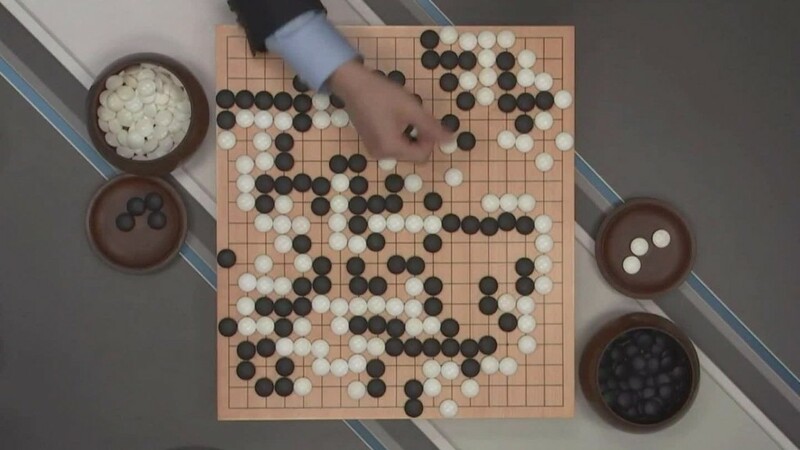 The matches were played on a tabletop board, and a Google representative placed AlphaGo's stones, after receiving directions on an adjacent computer monitor. The film arrives at a time when society worries if robots will one day take the jobs of humans -- or worse, make our species irrelevant. Related: Robots: Is your job at risk? Man versus machine conflicts are common in pop culture -- such as IBM's Watson beating Ken Jennings in Jeopardy in 2011, or IBM's Deep Blue beating Russian Gary Kasparov in chess in 1997. "I for one welcome our new computer overlords," Jennings wrote under his Final Jeopardy answer as he lost to Watson. But the documentary highlights how battles of robots versus humans are actually struggles between humans. One side is represented by a man-made machine, such as Alpha, DeepBlue or Watson. If anyone is a new "overlord," it's not computers, but those who program them. The filmmakers follow the artificial intelligence experts from Google's DeepMind lab who created AlphaGo. They nervously observe the match from a private room crowded with TV monitors. This human side of AlphaGo was hidden from the millions who watched live on TV and YouTube as AlphaGo defeated Sedol. These researchers, who are experts in the trendy field of artificial intelligence called deep learning, spent years creating AlphaGo. AlphaGo was first trained on 30 million moves from actual games of Go, so it could learn which ones were most likely to succeed. Then it played itself, testing different strategies. This process of trial and error helped it better understand the game. The Google team entered the showdown with Sedol knowing their creation was not perfect and might lose to a player of his caliber. Sedol, 34, has won 18 international championships. He became a professional Go player at age 12. When AlphaGo triumphs, Google's DeepMind's team -- with more than a dozen humans -- gathered around the board for a photo celebrating the accomplishment. "It's natural that humans want humans to win, that's a natural response, but AlphaGo is human created," David Silver, the DeepMind programmer who led AlphaGo's development, explains during the film. "Everything AlphaGo does is because a human has either created the data that it learns from, created the learning algorithm that learns from that data [or] created the search algorithm. All of these things come from humans." AlphaGo couldn't win, or even exist, without the help of humans. But that hasn't halted society's tendency to be wary of powerful new technology. During the film, Sedol discusses how he heard of celebration in the streets that he -- a human -- won one of the match's five games. "People felt helplessness and fear. It seemed we humans are so weak and fragile," Sedol said. "And this victory meant we could still hold our own." Lee Sedol was the center of attention during his showdown with AlphaGo. Those human insecurities surface elsewhere in the film. Fan Hui, a European-based Go champion in Europe, plays an earlier version of AlphaGo and loses. He's deeply troubled by the defeat. But later, Hui teams up with the Google team to help develop AlphaGo. He continued playing AlphaGo, testing strategies to reveal its weaknesses. 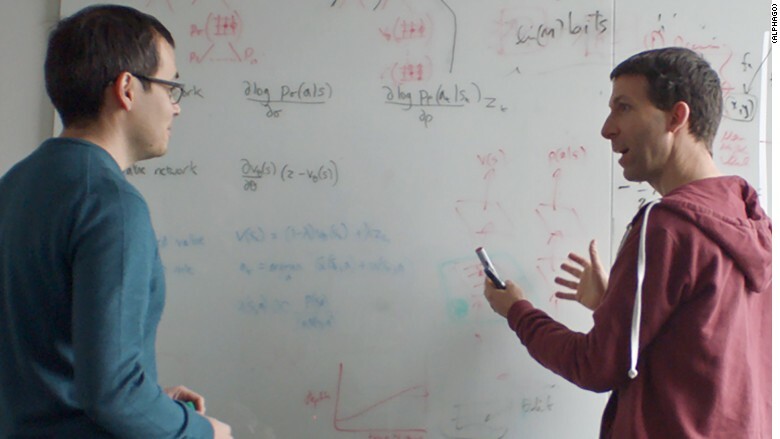 He then shared his findings with AlphaGo's creators to improve the system. DeepMind CEO Demis Hassabis, left, and his colleague David Silver feature prominently in the AlphaGo documentary. As the film explores the conflict of humans versus machines, it has a lingering message: Humans won't become obsolete. Those who learn to work with machines are more powerful than ever. Ultimately, Sedol's lost to AlphaGo helped him see the game in a new way. "He improved through this machine. His humanness was expanded after playing this inanimate creation," reporter Cade Metz, who covered the match for Wired, notes in the film. "The hope is that machine and in particular the technologies behind it can have the same effect with all of us."